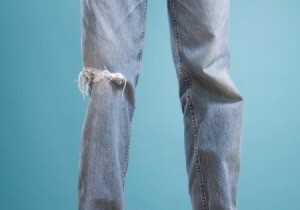 The knees on pants take a lot of abuse and tend to wear out long before the rest of the garment. Rather than throwing them out, you can patch the knees. This is a guide about patching knees on pants. My husband had a pair of gardening pants which he had worn out at the knees. He asked me if I could mend them. So I decided to visit the dollar store to see if I could find any knee patches. I couldn't find any, but wandered over to the kitchen section and found pot holders (two for $1.00). I stitched the pot holders where he had worn out the knees. He now has mended pants with padding on his knees. Save the fabric when you turn a winter long-sleeved shirt into a summer short-sleeved shirt and use this fabric to patch the knees or add length to kids pants. The shirt can then be worn with the pants as a cute matching set! This tip works great for kids, but can also be used for adult clothes as well.